Local Council commissioned work at Sports hall of a West Midlands Academy. 2-3 days within timeframe of school holidays. Jtech Services have recently completed the installation of a specially designed aluminium profile at the Sports Hall of a West Midlands Academy. During an upgrade of the air handling system on site the heating engineers insulated all the new pipework as is standard practice. 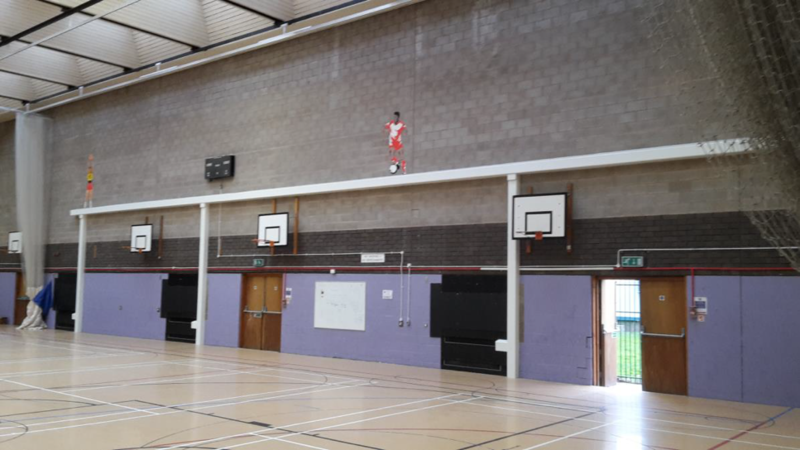 This room was not only used as a Sports Hall for the Academy, but is also part of a leisure complex for use by the public outside of school time. Clearly the insulated pipework needed protection from footballs, cricket balls and other impacts. Instead of the standard metal based profile generally offered by Jtech Services, there were a number of other requirements that also needed to be met for this application. For example not only did the profile need to be robust, but also all the horizontal runs had to have a sloping top face so that nothing would stay on it, but would naturally roll off. Jtech Services are primarily known for the manufacture, supply and installation of their LST (Low Surface Temperature) Radiator Guards & Pipe Boxing systems that have been installed in many schools, hospitals and nursing homes throughout the UK. Visit the Jtech Services YouTube Channel and follow us to see our latest projects.